As all you classic scholars know Sanctus Nicolaus is Latin for Saint Nicholas, or Father Christmas to you and me. Saint Nicholas was actually a 4th century Greek Christian bishop who lived in what is now Turkey and was famous for his generous gifts to the poor. The horse that I will write about, named in part after St Nick (using the Latin spelling), is the 1961 Grand National winner Nicolaus Silver. In fact the grey Nicolaus Silver took his name from his sire Nicolaus, a son of the 1925 St Leger winner Solario, who was by the wartime Triple Crown hero Gainsborough. Solario would also win the 1926 Gold Cup at Ascot over 2 ½ miles and clearly had plenty of stamina, a trait that his grandson would later require around the demanding Aintree course. Nicolaus had a superb pedigree being a half-brother to Nearco, one of the greatest sires of all-time. Federico Tesio, the breeder of both horses, was reported to have described Nicolaus as the best looking horse that he had ever bred. Presumably the silver in Nicolaus Silver was a simple reference to his colour, being a grey horse like his dam Rays Of Montrose. Bred in Ireland and foaled in 1952, Nicolaus Silver was only considered to be a moderate chaser in his early career but often this was because he ran on unsuitably heavy ground over in Ireland. When his Irish trainer died suddenly in 1960, the horse was put up for sale in Dublin and bought by Fred Rimell on behalf of owner Charles Vaughan. Rimell had already won the Grand National with E.S.B. in 1956 and was on the look out for a second winner of the great steeplechase. Fred Rimell was one of the most colourful and distinguished figures in National Hunt racing and he would go on to train a record four Grand National winners in total. He was champion NH trainer five times and also had the distinction of being champion jockey four times before a nasty fall in the 1947 Cheltenham Gold Cup ended his career in the saddle and he switched to training. He trained in Worcestershire and initially Nicolaus Silver was not overly impressive at home on the gallops. But under Rimell’s skillful tutelage the horse made significant progress and won his final prep race for Liverpool, the Kim Muir Chase, at the Cheltenham Festival in 1961. Such was the improvement in the grey that spring that Rimell went to Aintree confident that Nicolaus Silver would have a great chance of winning the Grand National. It was not all plain sailing in the run up to the race however. There were rumours of a doping plot, so as a precaution another grey, High Spot, was sent in the box bearing Nicolaus Silver’s name. High Spot was never deemed fit enough to race again. Happily the nine-year-old was able to line up for the race fit and well and, ridden by Bobby Beasley and carrying 10-1, Nicolaus Silver won comfortably by five lengths on his favoured fast ground at odds of 28/1. 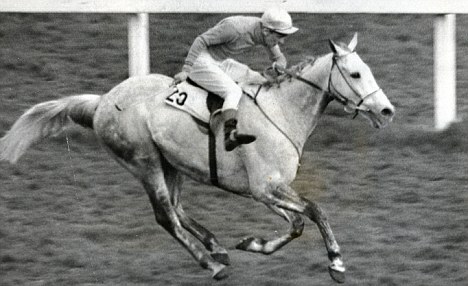 Merryman, the 1960 Grand National winner, was second with the 1962 winner Kilmore back in fifth. He would run again in the next two Grand Nationals but would only finish seventh and tenth respectively. Following his win in the race (the prize money had gone up significantly that year) he would become the all-time leading money earner in National Hunt racing until overtaken by Mandarin in 1962. Nicolaus Silver is one of a very select group of only three grey horses to win the Grand National. The other two were The Lamb (1868 and 1871) and Neptune Collonges (2012). And although his name is often misspelled, his glorious victory in that great race will never be forgotten.